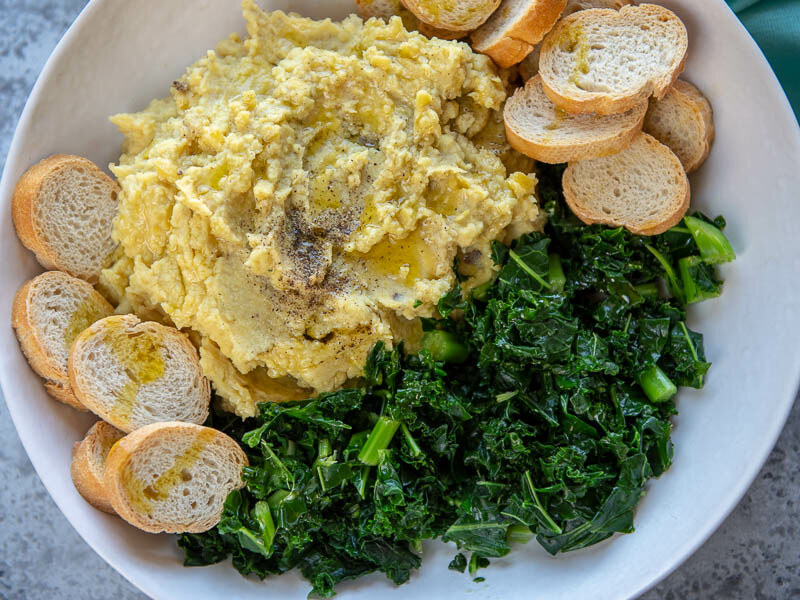 This easy and delicious Purè di fave e Cicorie – Fava Bean Puree with Chicory — is a traditional antipasti dish from Puglia, Italy. Made with dried fava beans, this healthy soul-satisfying vegan dish captures the best of the Mediterranean diet in both simplicity and flavour. 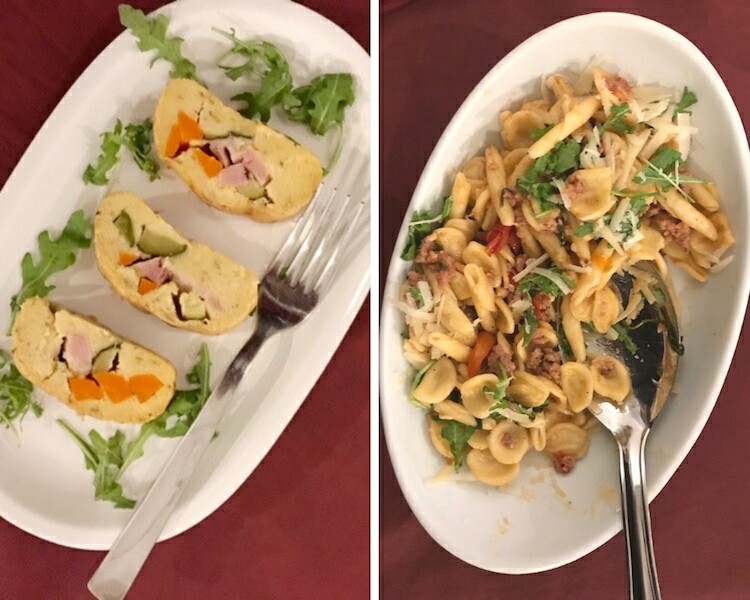 In Puglia, the cucina povera tradition (literally meaning poor kitchen) celebrates the art of making great food with simple, yet high quality,mostly plant based, seasonal ingredients. Meals are enjoyed, family-style and shared, along with conversation over long leisurely lunches while the sun shines on tables set outdoors on terraces or beside open windows offering panoramic views of the sea or historic streets. 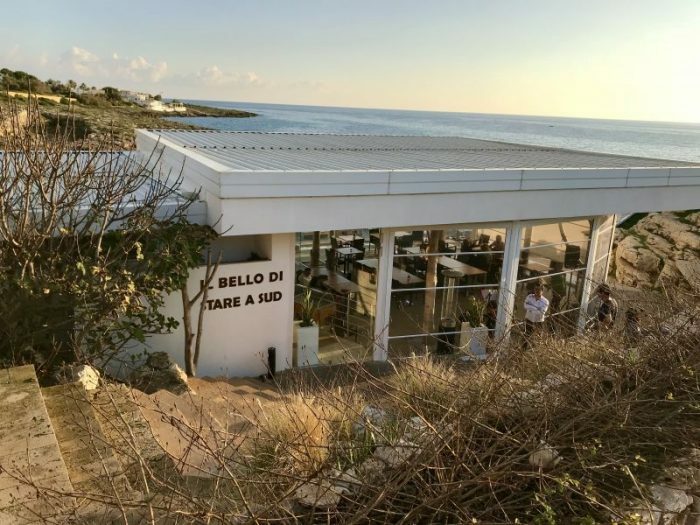 Unlike eating a quick sandwich at your desk or lunch over the sink as we might do in North America, on the Salento Peninsula of southern Puglia, Italy diners pay full attention to the experience of eating and drinking. Health Canada’s new Canada Food Guide seems to have adopted this Mediterranean philosophy of holistic eating. In its first update in 12 years, it recommends we choose plant-based proteins as an alternative to meat, cook more often and eat meals with others. The focus is on eating and living well. While the concept of mindful eating might be new to many North Americans, it’s been a part of life in Italy for centuries. While fish and seafood are generally enjoyed at least twice a week, the Mediterranean diet focuses on plant-based foods such as fruit and vegetables, whole grains, legumes ( beans and peas), nuts and seeds. It doesn’t advocate the consumption of large portions of red meat. The Mediterranean diet also promotes healthy fats, choosing olive oil in place of saturated fats such as butter. Oh, and there’s the wine too. The Mediterranean diet recognizes that a glass of wine with dinner can provide health benefits when enjoyed in moderation. 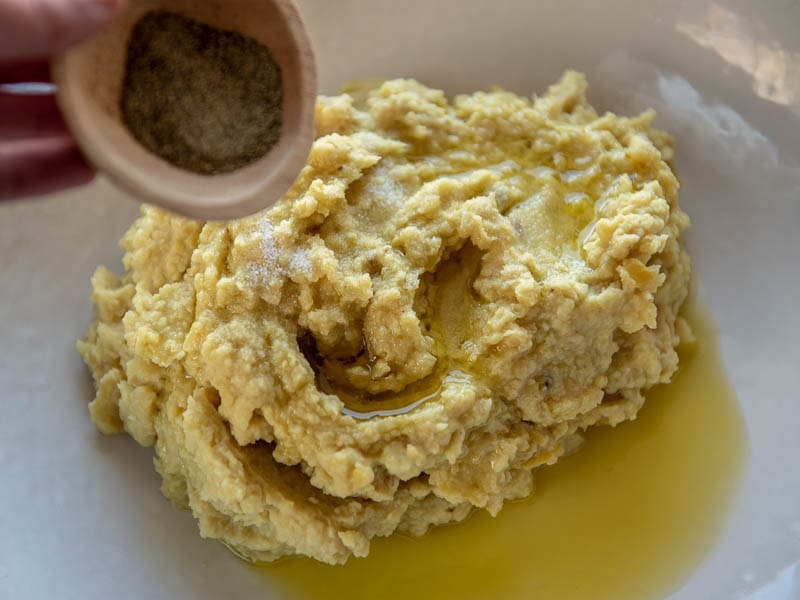 This dried fava bean recipe for Purè di fave e Cicorie or Fava Bean Puree with chicory is a perfect example of this healthy approach to eating. 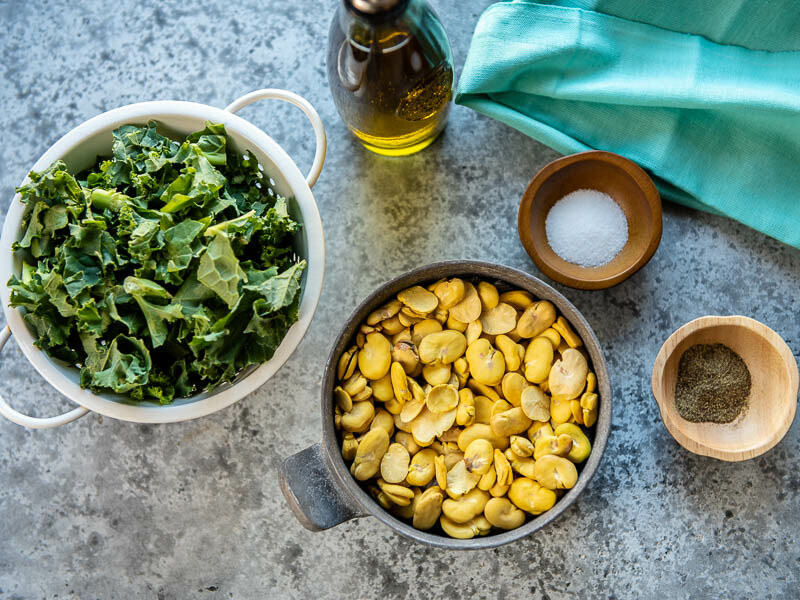 It features dried legumes with olive oil and not much else, yet is so creamy and soul-satisfying, you’ll want to enjoy it at every meal as a side dish. Purè di Fave e Cicoria can also be enjoyed as a fava bean dip appetizer. 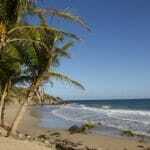 With a glass of wine from the Salento Region perhaps. I purchased my bag of dried fava beans during the Novello in Festa (New Wine Festival in November) in Leverano, north of Gallipoli inland from the Gulf of Taranto coastline. Since 1968, Mulino Dell’Anna has been producing and selling dried legumes including lentils, fava beans and more in the Leverano region. 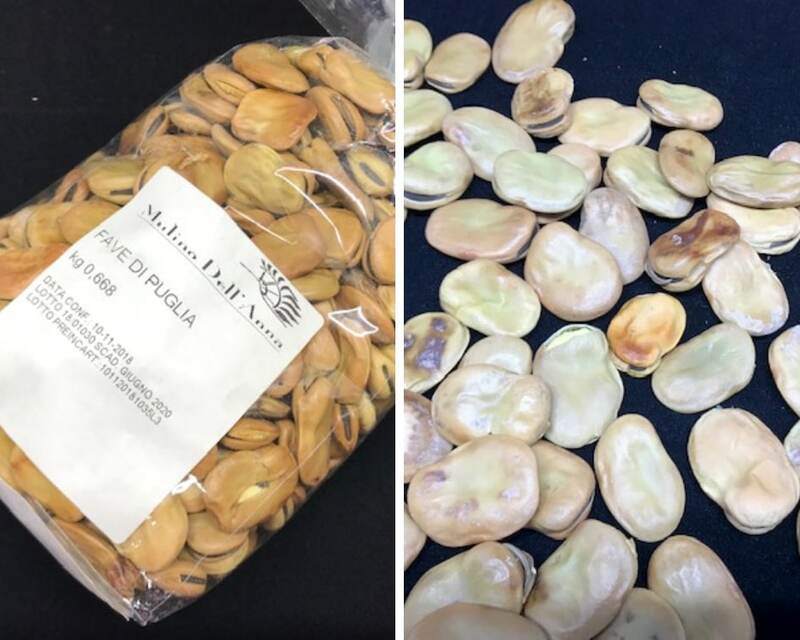 It’s possible to order dried fava beans online. The key is to be sure to purchase beans that don’t require peeling. That’s a time-consuming task you want to avoid! Bob’s Red Mill Fava Beans offer the advantage of being pre-boiled which means you don’t have to peel the fava beans. The biggest challenge I had in recreating this dish was sourcing the chicory. 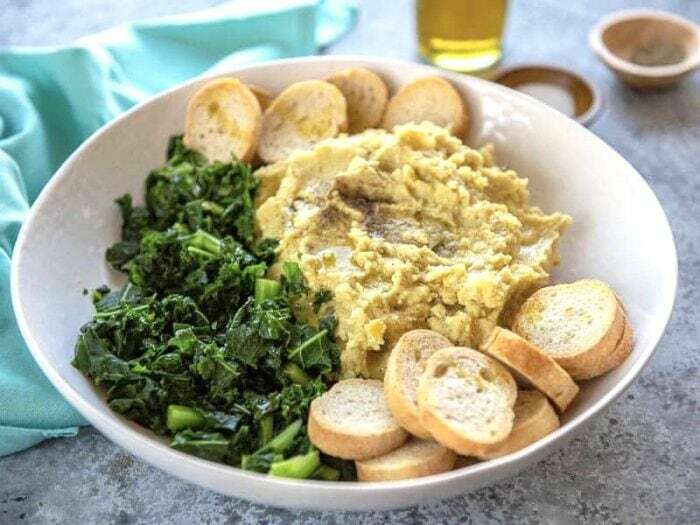 The slightly bitter greens are a perfect complement to the sweet, creamy flavour of the pureed fava beans. It really is a marriage of two perfect textures and flavours, so Purè di Fave e Cicoria is not the same without it. 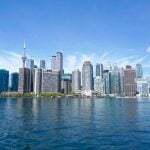 While I spotted bins of chicory everywhere throughout the Salento region in November, it just isn’t readily available here in Canada or many regions of North America. We’re much more familiar with chicory root, which is often roasted and used as a coffee substitute. Chicory Catalogna Pugliese (along with many other varieties of chicory in Puglia), is harvested in fall and has long white stems with serrated green leaves. It has a slightly bitter, bright flavour that adds a lot of personality to a dish. Italian chicory reminds me of callaloo in the Caribbean in that it grows abundantly and very quickly like a wild green. 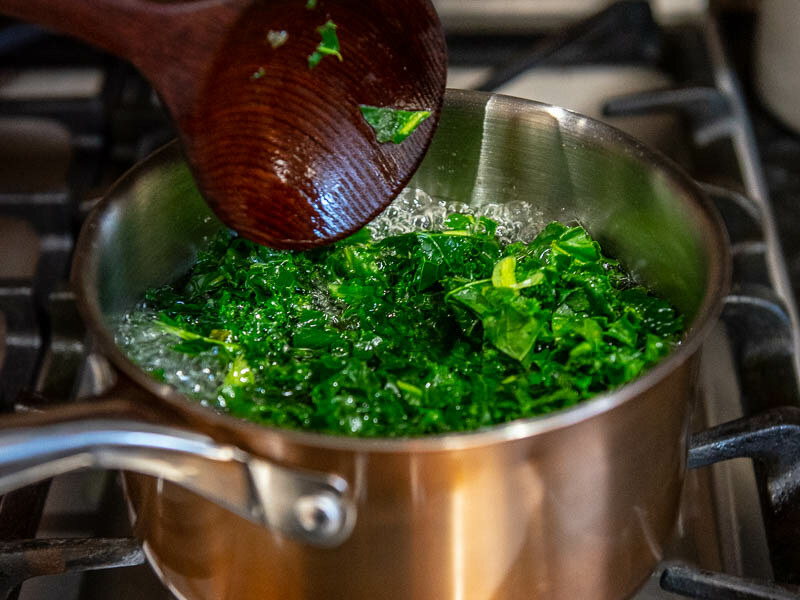 For this Purè di Fave e Cicoria recipe, a good substitute for fresh chicory leaves would be dandelion leaves, kale, rapini or escarole. 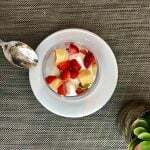 This recipe for Purè di Fave e Cicorie was generously supplied to me by Valentina Bovino of Vinha Trattoria Vineria in Matino, a tiny town that’s part of the Unione dei Comuni Jonica-Salentina a collection of five towns within easy driving distance of the beautiful beaches of the Ionian Coast on the Salento Peninsula. 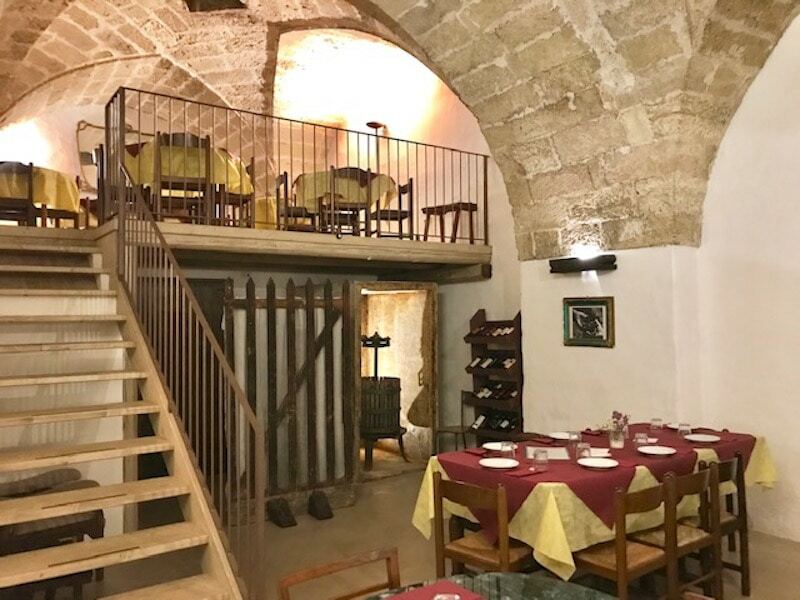 Located in the historic heart of Matino within a restored stone olive press building,Vinha Trattoria Vineria is a family-run restaurant that offers traditional dishes of the Salento Region. Some of my favourites of the many dishes I enjoyed during our visit included strudel con tonno and zucchine, flan di ricotta con scamorza affumicata e melanzane, insalata verde cicorie e finocchi and of course, this Purè di Fave. The wine cellar features a wide selection of local wines such as Negroamaro and Primitivo. If you’re in Matino, definitely stop by Vinha Trattoria Vineria and enjoy the menu of the day or an aperitif. First wash the dried fava beans well. Cover them with at least two inches of water above the beans and soak them in water overnight or a minimum of six hours. Drain beans and place in a pot with enough water to cover the beans with an inch of water. While the beans are cooking, trim the stems of the chicory by around one inch. Clean well and cut in half lengthwise if the leaves are really long. Boil in salted water until tender (around 10 minutes) and drain. 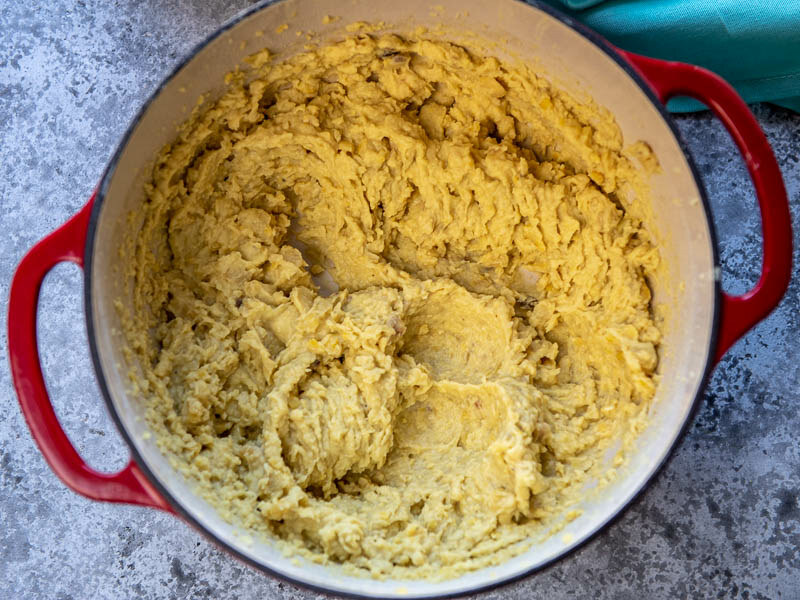 Once the fava beans are soft, mash them until very smooth and creamy. You may need to add water or olive oil to the mixture to make it soft and creamy. Mash the boiled fava beans until smooth and creamySeason with salt and pepper. Drizzle with extra virgin olive oil from Salento Italy. The Adamo brand of olive oil is highly regarded. Use the best quality extra virgin Italian olive oil you can find and afford. In the south of Salento, Puglia, the Adamo family has been producing extra virgin olive oil from a variety of trees ( Ogliarola, Cellina di Nardo, Leccino, Nocellara, Carollea and Pichline) for three generations. This award-winning olive oil is produced without pesticides and offers a fruity taste that’s perfect with vegetables or soups. You can purchase it online at Amazon. 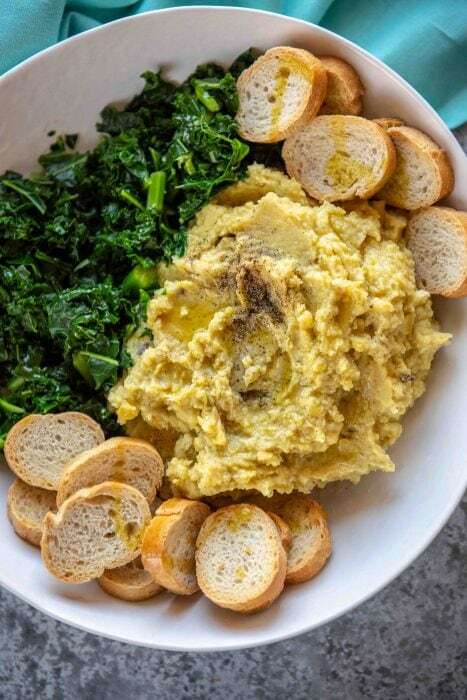 Adding a peeled potato to the fava beans at the end of the cooking process can help make the fava bean puree extra creamy, the key to the success of this dish. Dandelion greens are a great substitute for chicory and they offer potential health benefits including helping to fight inflammation, aiding blood sugar control and boosting the immune system. 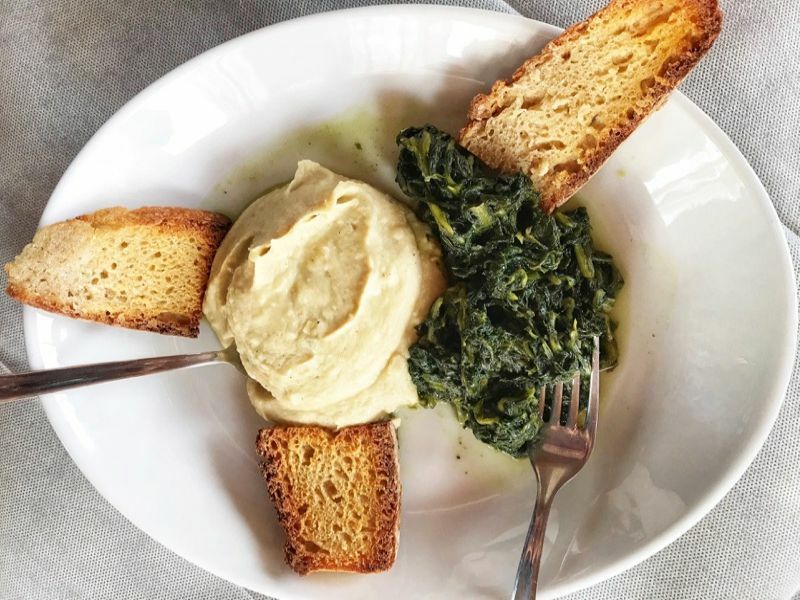 Delicious Purè di fave e Cicorie - Fava Bean Puree with Chicory - is a traditional antipasti dish from Puglia, Italy. 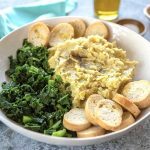 Made with dried fava beans, this healthy soul-satisfying vegan dish captures the best of the Mediterranean diet in both simplicity and flavour. While the beans are cooking, trim the stems of the chicory by one inch. Clean well and cut in half lengthwise if the leaves are really long. Boil in salted water until tender (around 10 minutes) and drain ( reserving a small amount 50 ml of the cooking liquid). 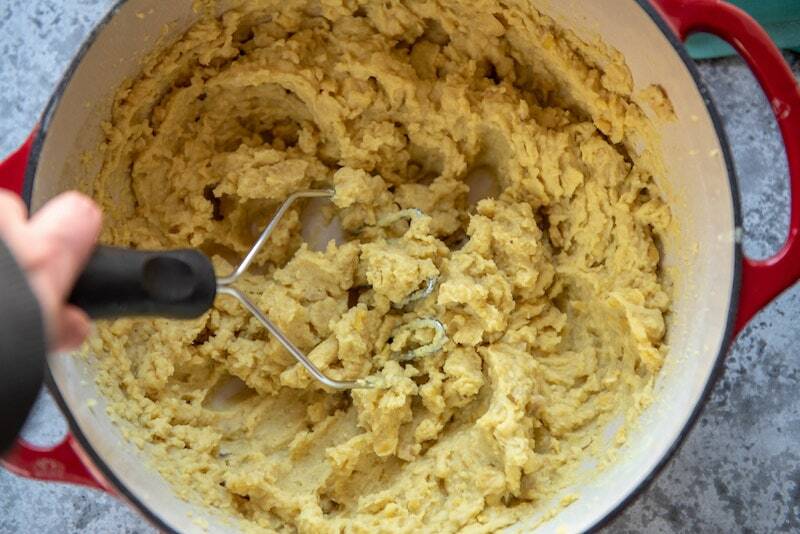 Once the fava beans have finished cooking and are very soft, mash them until smooth. If the puree appears dry, add a bit of reserved water until very creamy. Season with salt and pepper to taste and drizzle with olive oil. Serve in a shallow serving dish with the boiled chicory on the side and crostini or crusty bread. You can substitute dandelion leaves for fresh chicory with good success. Belgian Endive is often called chicory but these small boat-shaped white leaves, while also deliciously bitter, are not suitable for this recipe. 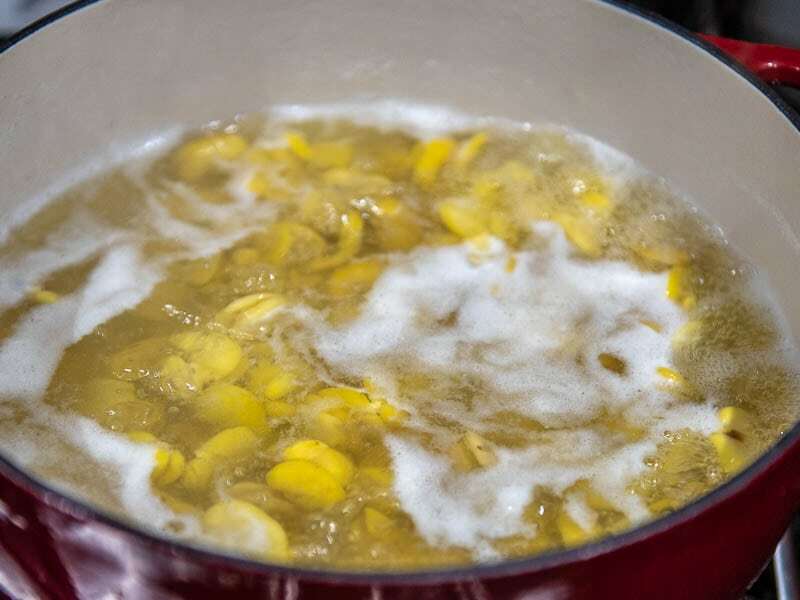 Adding a peeled potato at the end of the cooking process of the fava beans can help make the fava bean puree creamier. This post contains affiliate links. Check our Disclosure Page for more information. My family is from Southern Italy and I grew up eating Fava beans. This looks like such a delicious take on them. Excellent recipe! I love fava beans; in Mexico, we eat them a lot too. It is incredible how Italian cuisine is so vast and has so much history. I have never been to Puglia, but it is on my to-do list. They have great wines too! Thanks for the tip! I spend a lot of time in Mexico so will keep an eye out for fava beans and try making it this puree there as well. What a beautiful location to enjoy this delicious meal! 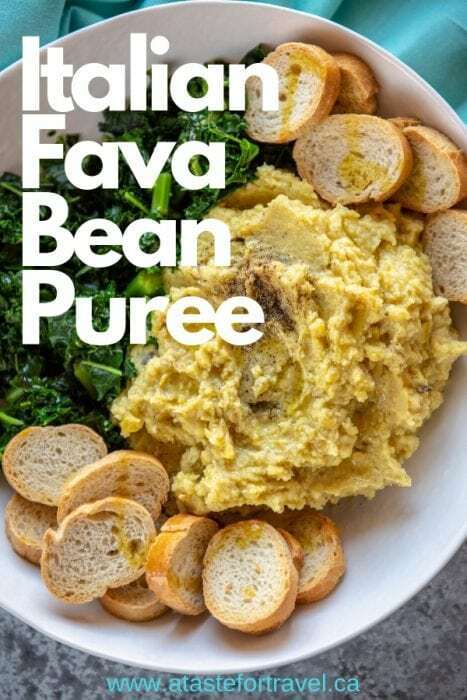 Fava bean puree sounds like a delicious alternative to hummus. 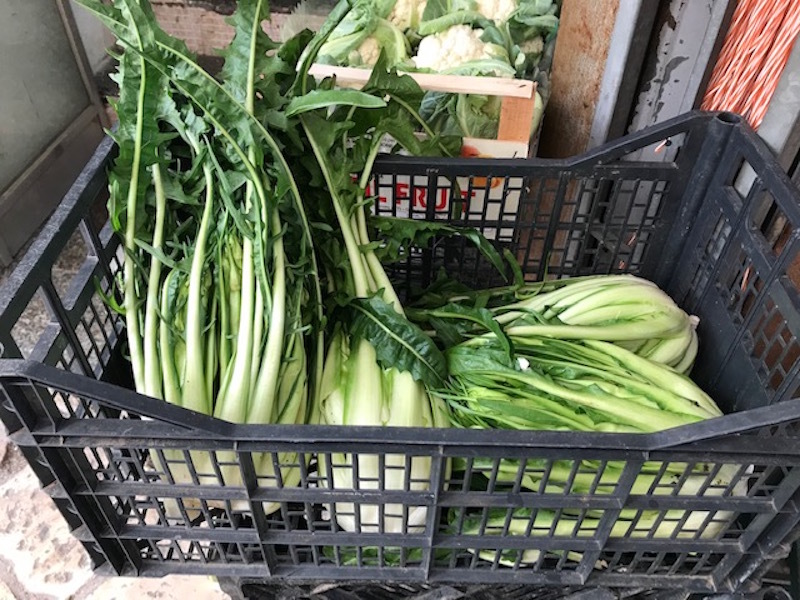 Thanks for posting the photo of the chicory in the Puglia market, I’m sure I can find it here in Toronto even if labelled with another name. What I won’t find here is the wonderful Italian bread that you photographed so well I can almost taste the texture and smell the aroma. More simple recipes from Salento, please! This definitely looks like something my family will love! I can’t wait to try this! Simple yet so delicious. ANd healthy and nutritious. My kinda side. I must give this a try.